Last night I had the pleasure of meeting Tom Laird aka @progscot (pictured above)... a DJ on the community radio station KOOP in Austin, Texas; He hosts a music show called Fade To Yellow which plays my kind of music... post-rock, IDM, electronic, neo-classical and ambient drone. He's from Scotland (hence the "Scot" part of his twitter name) and was over with his lovely partner Sandy for a wee visit. 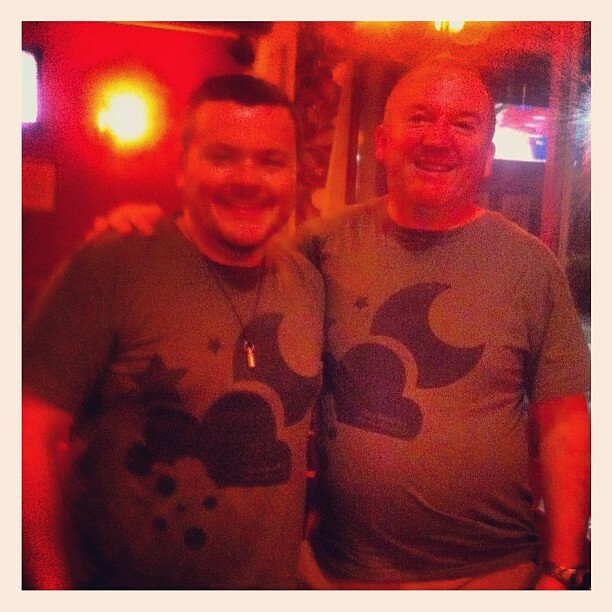 We spent a lovely couple of hours talking about the music I talk about on this blog... celebrating our shared love of Good Weather for an Airstrike (we are pictured about both wearing our GWFAA tees), Matt Stevens, The Fierce and The Dead, The Northern Hemisphere and others. I had my moleskine out and was scribbling down bands to check out with Tom typing away on his iPhone, trying to record all my recommendations. I turned him on to Cousin Silas' latest release... but really wish I had burned him a CDr with it on for him to listen to in his car. It was a fab couple of hours... hopefully we weren't too dull and nerdy for Sandy. 1) The power of community. Social media has it's detractors... but this evening was proof positive of the power of social media (e.g. Twitter and Facebook). It was through these mediums that both Tom and I met... and learn about the majority of the music we love. We are part of a wider community of music fans that is facilitated by these forms of media. Our conversation was from a running start, thanks to social media, rather than a standing start. 2) The need for likeminded community. This conversation was the first I've had whereby the person I was speaking to had a greater knowledge of the bands / music we were discussing than I did. Normally, I'm raving about this music and the poor, unfortunate soul who is listening is yawning, rolling their eyes etc. It was great to not feel alone or different, for a change... and to talk with someone who "got me" when it came to the subject matter. The 'togetherness' of community is vitally important... I felt great afterwards... the sense of being in the company of a likeminded soul is a powerful experience. One that I was glad to have had.